The old stone wall bordering the street had long reminded me of the English countryside, stretching as it does, nearly a thousand feet along the road. Above it extends a gentle slope green with bracken fern and full sun in our otherwise heavily wooded mountain town. I had walked to this property often from the local library and dreamed of flapping a blanket under the giant Live Oak like others who had used the land illicitly until old Mildred Johnson died. A granddaughter of homesteader John Bonebrake—who’d once owned a hardware store in Oklahoma and travelled west, settling in this lumber town in the San Lorenzo Valley with his wife Elvina—Mildred, was the last of three spinster sisters to call the place home. Without an heir, the property—one of the first settled in Boulder Creek, California—left the family for the first time in over one hundred years. Four acres of pear and walnut trees, a prolific persimmon, a creek, and farmhouse on one side of the road, redwood groves, sandy expanses, and seven spacious acres with rock-terraced hillside on the other, were deeded to the Historical Society and Park and Recreation District, jointly. The agencies, unable to agree on whether to build a museum or a park, decided to sell, and my once innocent desire to picnic on the knoll swelled like ripe persimmons to full-fledged longing. I lived nearby at the bottom of a sunless ridge, runoff flooding our basement and septic tank most winters. My neighbors were living in their own derelict states: one about to be arrested for child abuse, drug dealing, and tax evasion, the other camped in a trailer while his house, a burned out shell, yawned behind him. I was home all day with my children. We needed out. My fellow townsfolk were abuzz with offer talk, and I expected tight competition, but our full-priced offer was the only one made. Perhaps the others felt as I had—unworthy of this land, inadequate in light of its history. And yet it became mine. 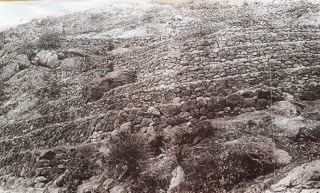 Not until my husband and I signed escrow papers for our claim to this part of Swain’s Addition to Boulder Creek, did we learn that the five-acre hillside overgrown with brush was terraced to the top with stone walls, as evidenced in the Historical Society’s 1880s photo. The picture depicted twenty-nine terraced rock walls on an otherwise bare hillside, and a small man, probably Remus Swain himself, wearing a large hat and sitting halfway to the top of the ridge, dwarfed by the rock-scape. But these walls, made of individually stacked stones placed without mortar, had survived two devastating earthquakes: the great San Francisco earthquake of 1906 and the 1989 Loma Prieta quake. The Loma Prieta struck one afternoon while I stood on a friend’s deck, holding my toddler, while her daughter turned cartwheels, until the ground began heaving in waves before us, the epicenter a scant few miles away. Ten homes were destroyed in my old neighborhood two miles from these sturdy walls. Exploring my new backyard terraces, I found a sandstone monolith engraved with graffiti, modern day petroglyphs carved by hikers and campers on their way to Big Basin State Park. My fingers slid over the roughly etched names and an eye inside a triangle. I discovered charred fire-pits ringed with empty cans of beans and beer, moldered tents and sleeping bags, decomposing clothes. The day the bulldozer came to dig our foundation a homeless man emerged from a redwood grove roused from sleep by the noise. How many men had these stubborn walls and overgrowth of eucalyptus, juniper, and Scotch broom sheltered over the years, and where would they go to pitch tents away from prying eyes? Remus Swain was the first settler to make his home here. He pushed east with others from Santa Cruz into the forest. They forged wagon trails along the San Lorenzo River into big stands of Coast Redwoods, and cut the giants to stumps, paving the way for hard-working, hard-drinking men and the scattered towns that followed: Felton, Bonny Doon, Ben Lomond, Lorenzo, Boulder Creek. Swain owned a sawmill, and my hillside isn’t the only one he denuded. Of course, he didn’t do it alone, Swain hired loggers, muscled and rowdy, and who kept the sixteen taverns and brothels in Boulder Creek in business. The Sequoia sempervirens—alive since the time of Christ—were two hundred feet tall with circumferences big as dance floors when they were felled, chopped, milled, hewn into boards, and freighted to San Francisco by rail to build houses and stores. Swain, and others like him, became rich, until the lumber ran out. The redwoods are second and third growth now, but the stone walls are original. One lines the street, and another twenty-nine snake across the mountain flank. Nearly a thousand feet in length, they terrace five acres. 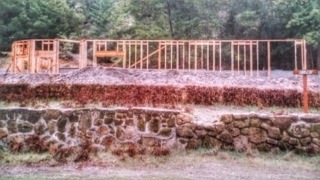 Each piece of granite and Zayante sandstone was carried, stacked, and fitted into place, one at a time. Between the walls, which are roughly ten feet apart, the dirt was tamped flat and planted with eucalyptus trees and shrubs according to the nursery receipt in the Historical Society archives. It’s undocumented but asserted in the area’s slight historical volumes, that the hands building these walls belonged to the Chinese who made their way to the greater Monterey Bay to build railroads that chugged lumber and other necessities through the treacherous Santa Cruz mountains—where dynamiting tunnels proved deadly—to the Santa Clara Valley and beyond. Some of these industrious men (how many, I have no idea), living in camps segregated from the Europeans, were diverted to the more domestic and aesthetically pleasing task of shoring up my mountainside. After years of laboring in this yard myself, sweating and swaying in the summer heat as I planted flowers and harvested vegetables—I thought of those men as more than historical trivia: men with bruised legs as they hefted boulders, bloodied fingers as their gloves wore through, throats scratched dry with dust and grit accumulating in their water buckets. I thought of their long trek to the creek in the afternoon swelter. I imagined their cooking fires in the terrace now occupied by my house, swimming pool, and garden. Could they imagine their toil on this naked hillside would one day anchor living quarters so enchanting and comfortable? Near dusk one August day, after I watered my potted roses, I pulled weeds near the for sale sign we had erected and wondered who would buy this land from us as we planned a reluctant departure from our dream home. An economic recession had drained our resources, just as the lumber had run out for Remus Swain and labor demands elsewhere carried the Chinese workers away. Would the new owners care at all about its history, about Remus Swain, the Bonebrakes, Mildred Johnson, or the Chinese laborers who built these walls? Hawks glided overhead on thermal currents, the sun slipped low. That evening bats circled, feasting on mosquitoes as dark fell and an owl called. I slipped into the hot tub, a modern luxury, steam rising off my body like fog, and watched meteors from the Perseid shower streak across the sky. I imagined a dozen braided Chinese men, cracked hands laced together behind their heads while they stretched out on wool blankets in this exact spot looking heavenward at a similar sight 120 years ago. Was it too late to thank them? For surely they paid the price for my desire. Cathy Warner moved from her historic California property to Puget Sound, where she writes, edits, blogs, leads workshops, and renovates homes with her husband. Cathy holds an MFA in Creative Writing from Seattle Pacific University and has authored a poetry volume Burnt Offerings. Her poetry, short stories, and essays have appeared in dozens of literary journals and anthologies. Visit her website.